The Undertaking of Lily Chen is a love story, an adventure, a journey of a boy becoming a man and a story of familial constraints and expectations. It is sweeping yet simple, profound and artfully presented as it questions and comments on cultural traditions and expectations. Deshi sets out on a journey to find a wife for his brother. The catch is that his brother is dead and preferably the woman that he finds for him will also be dead. Chinese tradition demands that husbands and wives share a grave and because Wei died before he was wed he will be alone for eternity. Deshi is side tracked and side swiped when he meets a girl who he hopes to murder and lie to rest with his brother. She is opinionated, strong willed, materialistic and driven. 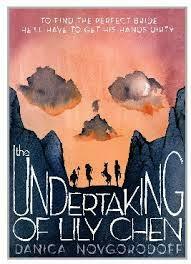 With unpredictable twists, lush illustrations and poetic text, The Undertaking of Lily Chen warrants multiple reads. 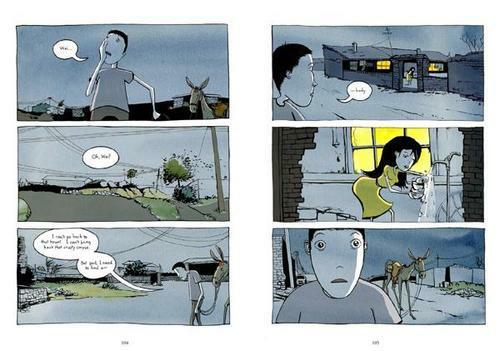 It would be an appropriate read for fans of graphic novels from high school and up and, anyone interested in Chinese culture will appreciate the exquisite attention to detail.